Singer-actress Cher is 72 on May 20. May 20: Actor David Proval (“The Sopranos”) is 76. 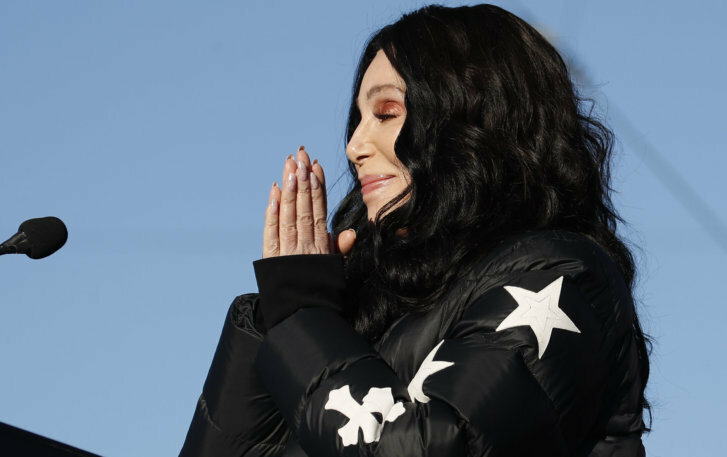 Singer-actress Cher is 72. Actor Dave Thomas (“Grace Under Fire,” ”SCTV”) is 70. Musician Warren Cann of Ultravox is 68. Actor Dean Butler (“Little House on the Prairie”) is 62. Guitarist Jane Wiedlin of The Go-Go’s is 60. Actor Bronson Pinchot is 59. Singer Susan Cowsill of The Cowsills is 59. Actor John Billingsley (“True Blood,” ”Enterprise”) is 58. Actor Tony Goldwyn (“Scandal”) is 58. Singer Nick Heyward of Haircut 100 is 57. TV personality Ted Allen (“Queer Eye for the Straight Guy”) is 53. Actress Mindy Cohn (“Facts of Life”) is 52. Guitarist Tom Gorman of Belly is 52. Rapper Busta Rhymes is 46. Bassist Ryan Martinie of Mudvayne is 43. Actor Matt Czuchry is 41. Singer-actress Naturi Naughton (3LW) is 34. Country singer Jon Pardi is 33. May 21: Singer Ron Isley of the Isley Brothers is 77. Guitarist Hilton Valentine of The Animals is 75. Keyboardist Bill Champlin (Chicago) is 71. Actress Carol Potter (“Beverly Hills, 90210,” ”Sunset Beach”) is 70. Singer Leo Sayer is 70. Actor Mr. T is 66. Drummer Stan Lynch (Tom Petty and the Heartbreakers) is 63. Actor Judge Reinhold is 61. Actor-director Nick Cassavetes (“The Notebook”) is 59. Actor Brent Briscoe (“Mulholland Drive,” ”A Simple Plan”) is 57. Actress Lisa Edelstein (“House”) of 52. Actress Fairuza Balk (“The Waterboy”) is 44. Singer-guitarist Mikel Jollet of Airborne Toxic Event is 44. Rapper Havoc of Mobb Deep is 44. Actor Sunkrish Bala (“Castle”) is 34. Actor David Ajala (“Black Box”) is 32. Actress Ashlie Brillault (“Lizzie McGuire”) is 31. Country singer Cody Johnson is 31. Actor Scott Leavenworth (“7th Heaven”) is 28. Actress Sarah Ramos (“Parenthood,” ”American Dreams”) is 27. May 22: Actor Michael Constantine (“My Big Fat Greek Wedding,” ”Room 222″) is 91. Actor-director Richard Benjamin is 80. Actor Frank Converse is 80. Actress Barbara Parkins (“Peyton Place,” ”Valley of the Dolls”) is 76. Songwriter Bernie Taupin is 68. Actor Al Corley (“Dynasty”) is 63. Singer Morrissey is 59. Actress Ann Cusack (“Jeff Foxworthy Show,” ”A League of Their Own”) is 57. Bassist Dana Williams of Diamond Rio is 57. Guitarist Jesse Valenzuela of Gin Blossoms is 56. Actor Mark Christopher Lawrence (“Chuck”) is 54. Singer Johnny Gill is 52. Bassist Dan Roberts of Crash Test Dummies is 51. Actor Michael Kelly (“House of Cards”) is 49. Model Naomi Campbell is 48. Actress Anna Belknap (“CSI: NY”) is 46. Singer Donell Jones is 45. Actor Sean Gunn (“Guardians of the Galaxy,” ”Gilmore Girls”) is 44. Actress A.J. Langer (“Private Practice”) is 44. Actress Ginnifer Goodwin (“Once Upon a Time”) is 40. Singer Vivian Green is 39. Actress Maggie Q (“Insurgent,” ”Divergent”) is 39. Actress Molly Ephraim (“Last Man Standing”) is 32. Actress Anna Baryshnikov (“Superior Donuts”) is 26. Actress Camren Bicondova (“Gotham”) is 19. May 23: Actress Barbara Barrie is 87. Actress Joan Collins is 85. Actor Charles Kimbrough (“Murphy Brown”) is 82. Actress Lauren Chapin (“Father Knows Best”) is 73. Country singer Judy Rodman is 67. Comedian Drew Carey is 60. Actress Lea DeLaria (“Orange Is the New Black”) is 60. Country singer Shelly West is 60. Actor Linden Ashby (“Melrose Place”) is 58. Actress-model Karen Duffy is 57. Actress Melissa McBride (“The Walking Dead”) is 53. Drummer Phil Selway of Radiohead is 51. Drummer Matt Flynn of Maroon 5 is 48. Singer Lorenzo is 46. Country singer Brian McComas is 46. Singer Maxwell is 45. Singer Jewel is 44. Actress LaMonica Garrett (“Designated Survivor,” ”Sons of Anarchy”) is 43. Comedian Tim Robinson (“Saturday Night Live”) is 37. Actor Adam Wylie (“Picket Fences”) is 34. Director Ryan Coogler (“Black Panther”) is 32. Singer Sarah Jarosz is 27. May 24: Comedian Tommy Chong of Cheech and Chong is 80. Musician Bob Dylan is 77. Actor Gary Burghoff (“M.A.S.H.”) is 75. Singer Patti LaBelle is 74. Actress Priscilla Presley is 73. Country singer-songwriter Mike Reid is 71. Actor Jim Broadbent (“Moulin Rouge,” ”Iris”) is 69. Actor Alfred Molina is 65. Singer Rosanne Cash is 63. Actor Cliff Parisi (“Call the Midwife”) is 58. Actress Kristin Scott Thomas is 58. Bassist Jimmy Ashhurst of Buckcherry is 55. Keyboardist Vivian Trimble (Luscious Jackson) is 55. Actor John C. Reilly (“Chicago,” ”Gangs of New York”) is 53. Actor Dana Ashbrook (“Twin Peaks”) is 51. Actor Eric Close (“Nashville,” ”Without a Trace”) is 51. Actor Carl Payne (“Martin,” ”The Cosby Show”) is 49. Guitarist Rich Robinson (The Black Crowes) is 49. Actor Billy L. Sullivan (“Something So Right”) is 38. Actor-rapper Big Tyme is 37. Drummer Cody Hanson of Hinder is 36. Dancer Mark Ballas (“Dancing With the Stars”) is 32. Country singer Billy Gilman is 30. Rapper G-Eazy is 29. May 25: Actress Ann Robinson (“War of the Worlds”) is 89. Country singer Tom T. Hall is 82. Actor Ian McKellen (“Lord of the Rings”) is 79. Country singer Jessi Colter is 75. Actress-singer Leslie Uggams is 75. Director-Muppetteer Frank Oz is 74. Actress Karen Valentine is 71. Singer Klaus Meine of Scorpions is 70. Actress Patti D’Arbanville (“New York Undercover”) is 67. Actress Connie Sellecca is 63. Singer-guitarist Paul Weller of The Jam is 60. Actor-comedian Mike Myers is 55. Actress Anne Heche is 49. Actresses Sidney and Lindsay Greenbush (“Little House on the Prairie”) are 48. Actor Jamie Kennedy (“Scream”) is 48. Actress Octavia Spencer is 48. Actor Justin Henry (“Kramer Vs. Kramer”) is 47. Singer Lauryn Hill is 43. Actress Erinn Hayes (“Kevin Can Wait”) is 42. Actor Cillian Murphy (“The Dark Knight,” ”Batman Begins”) is 42. Actor Ethan Suplee (“My Name Is Earl”) is 42. Musician Guy Lawrence of Disclosure is 27. May 26: Drummer Garry Peterson of The Guess Who is 73. Singer Stevie Nicks is 70. Actor Philip Michael Thomas (“Miami Vice”) is 69. Actress Pam Grier is 69. Country singer Hank Williams Jr. is 69. Actress Margaret Colin is 60. Singer Dave Robbins (BlackHawk) is 59. Actor Doug Hutchison (“The Green Mile”) is 58. Comedian Bobcat Goldthwait is 56. Singer Lenny Kravitz is 54. Actress Helena Bonham Carter is 52. Drummer Phillip Rhodes of The Gin Blossoms is 50. Actor Joseph Fiennes (“Shakespeare in Love”) is 48. Singer Joey Kibble of Take 6 is 47. “South Park” co-creator Matt Stone is 47. Bassist Nathan Cochran of MercyMe is 40. Actress Elisabeth Harnois (“CSI”) is 39. Actor Hrach Titizian (“Homeland”) is 39.